March 2, 2011 by Theresa B. Clarke 0 comments on "Uh oh! 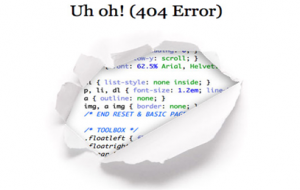 Detecting a 404 or Not Found Error on Individual Blog Posts and Pages in WordPress"
I have b een grading a few blog post assignments from my spring 2011 MKTG 470 class and I’m finding a common problem that my students aren’t clearly detecting. Namely, I am experiencing an inability to view some of their individual blog posts and web pages due to the “404 or Not Found error”. A 404 or Not Found error means that a client was able to establish communication with a server, but it couldn’t find the item that was requested, such as a blog post or web page. When visiting a WordPress “Home” page in a browser, this view shows links to web pages in the navigational structure as well as blog posts presented in reverse chronological order. However, when clicking on a link to an individual blog post or page, I encounter the “404 or Not Found” error. I presume my MKTG 470 students are not aware that this is happening because they are logged into their WordPress account when they view their individual pages and posts through a browser. Therefore an important tip is to log OUT of WordPress and then check to see if the blog post or web page is accessible via the direct link. Remember that the 404 Error will not be detected if you are logged into WordPress when viewing a specific web page or blog post. If you find that you are a victim of this problem, learn how to Fix the WordPress 404 Not Found Error. I welcome additional tips and suggestions regarding this issue.